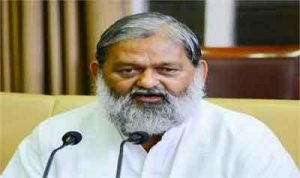 Chandigarh: Haryana Health Minister Anil Vij said on Wednesday that people would be diagnosed for diseases and if detected with having any kind of illness-free treatment would be provided. Mr Vij said in this endeavour, third ‘Cancer Care Centre’ for cancer cure was being established in Ambala which would have the best cancer treatment facility. He said cancer patients being treated at this centre in the state would not face any inconvenience. The Minister noted that as per the World Health Organisation, there should be one doctor per 1,000 people whereas in India, there is one doctor for every 1,800 people. Therefore, to meet the shortage of doctors in the state, recruitment of 995 doctors have been done.